Graffiti HeArt is taking on a home of its own and is making it real by welcoming world renown artist, Kelly “RISK” Graval, to Cleveland! RISK will be painting the new Graffiti HeArt gallery at the corner of Superior Avenue & E. 49th Street, the week of May 27th, making this spot a new art attraction in the region. Graffiti HeArt was founded in 2013 with a dream to provide opportunities for graffiti artists to get connected to commissioned projects, in helping beautify and revitalize spaces, while also generating funding for youth art scholarships for undeserved youth through the Pre-College Program at the Cleveland Institute of Art. Since then, more than $50,000 in scholarship funding, 25 teenage students, 10 public murals (in Northeast Ohio and Puerto Rico), and more than 50 commercial, corporate, and private mural art projects, Graffiti HeArt is getting a home of its own. 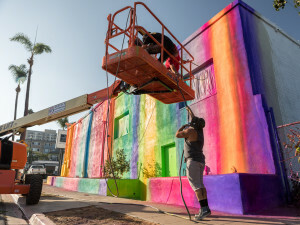 The new Graffiti HeArt gallery was acquired late 2018 with the goal to renovate and use as a graffiti gallery space with rotating pieces as well as future gallery shows by graffiti artists and students, as well as a space for art education programming, demonstrations, and workshops. Stamy Paul, President and Founder of Graffiti HeArt shared the story behind the new gallery, “I want this space to be used by artists that believe in our mission, who have engaged in projects with us, and who want to give back. There is a key element of the organization to ensure artists are not exploited and are paid competitive commissions, while also understanding the mission to pave ways for future artists, the youth in our community that don’t have the economic means or guidance, and to pay it forward by participating in passion projects along the way. 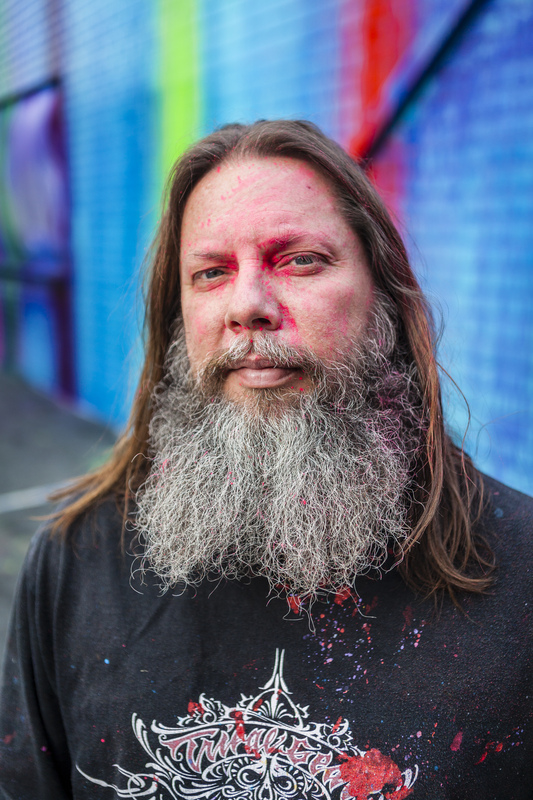 Having a space or ‘home’ for experienced and aspiring graffiti artists to create, to present, educate and just hang out and master their craft is a key reason for the gallery…to do so safely and with integrity,” said Paul. 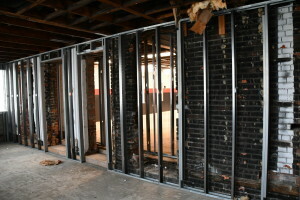 The building is undergoing renovations on this 1903 building which requires bathrooms, HVAC, and some TLC. ”It’s a very tight timeline as we’ve run into some delays with our permitting, however we have an excellent architecture and construction team in place, and should have everything ready and in place by the Grand Opening the week of May 27th”, added Paul. The building used to be part of the Ohio Technical College campus, until they decided they no longer needed this building and sold it to Paul in October 2018 as part of this passion project. OTC purchased the building in 2011 after being vacant and neglected, renovating it to a certain extent with the intent to use the space for its upholstery classroom, however those plans never transpired and the building remained vacant until the recent purchase by Paul. The story behind artist, Kelly “RISK” Graval started a few years back when Paul had connected with RISK and had followed his work and admired his story. 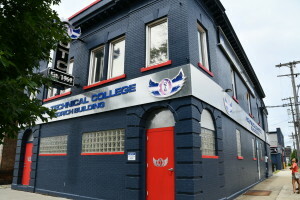 Kelly had agreed to come to Cleveland to transform the exterior of the new Graffiti HeArt gallery, which is now painted the OTC blue, red and black mirroring the rest of the OTC campus. Kelly “RISK“ Graval, also known as RISKY, is a Los Angeles-based graffiti artist and fashion entrepreneur. 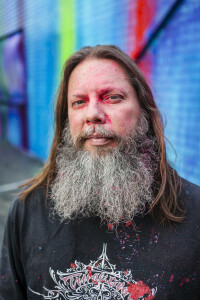 In the 1980s, RISK gained notoriety for his unique style and pushed the limits of graffiti: He was one of the first writers in Southern California to paint freight trains, and he pioneered writing on “heavens”, or freeway overpasses. At the peak of his career he took graffiti from the streets and into the gallery with the launch of the Third Rail series of art shows, and later parlayed the name into a line of graffiti-inspired clothing. Kelly will also be a part of the series of grand opening events starting with the $aving Banksy movie event at Capital Theatre May 30th, the Gallery Grand Opening VIP event May 31st, and the Community Open House and Ribbon Cutting on June 1st. Thursday, May 30th: Movie Night, 7PM at Capital Theatre: “Saving Banksy” movie with discussion after the movie with Executive Producer of the movie, Brian Greif and artist, Kelly “RISK” Graval. Friday, May 31st: Graffiti HeArt Gallery VIP reception: VIP Reception tickets from 6pm – 7pm, General Admission from 7pm – 10pm. Meet up with local graffiti artists as well as “RISK”, major donors and community friends and sponsors! Includes hors d’oeuvres, drinks, music, and more! Saturday, June 1st: Graffiti HeArt Gallery Open House & Ribbon Cutting! : Saturday, June 1st, 12PM – 6PM, Ribbon Cutting at 1PM. Food truck, beverages, live art, DJ. Tag Sponsors: Mary & Phil Borba; Old School Sponsors: Fit Technologies, Dealer Tire, Hilton Cleveland; Crew Sponsors: East of Aspen Construction, Dunlop & Johnston, Inc., Versani, Dante, Culinary Occasions, Councilman Hairston – Ward 10, and more!